The Mexican Copper Cazo is used in Mexican households to make cajeta (also known as dulce de leche), carnitas, polenta, chicharrones, and atoles, to name a few. The smaller sizes can also be used for an authentic and decorative look when serving your table. Your family and guests will be impressed by your ornamental and attractive table setting. Our Cazos are hand hammered heavy gauge 100% copper pieces with two copper handles for easy carrying and are handcrafted in Mexico. They are highly durable, capable of lasting for multiple generations. They have a semi-cone shape wider rim with a tapered narrower bottom which is a bit concave. Note: Because this product is handmade, the dimensions listed can vary slightly and may have some imperfections. These Mexican Cazos are meant for cooking, but can also be used for serving. They can be used directly on a gas or electric range, both glass or coil, as well as the conventional oven. The Cazo can also be used on any open flame setting, such as grill or fire pit. Being metal however, the Cazo cannot be used in a microwave oven. 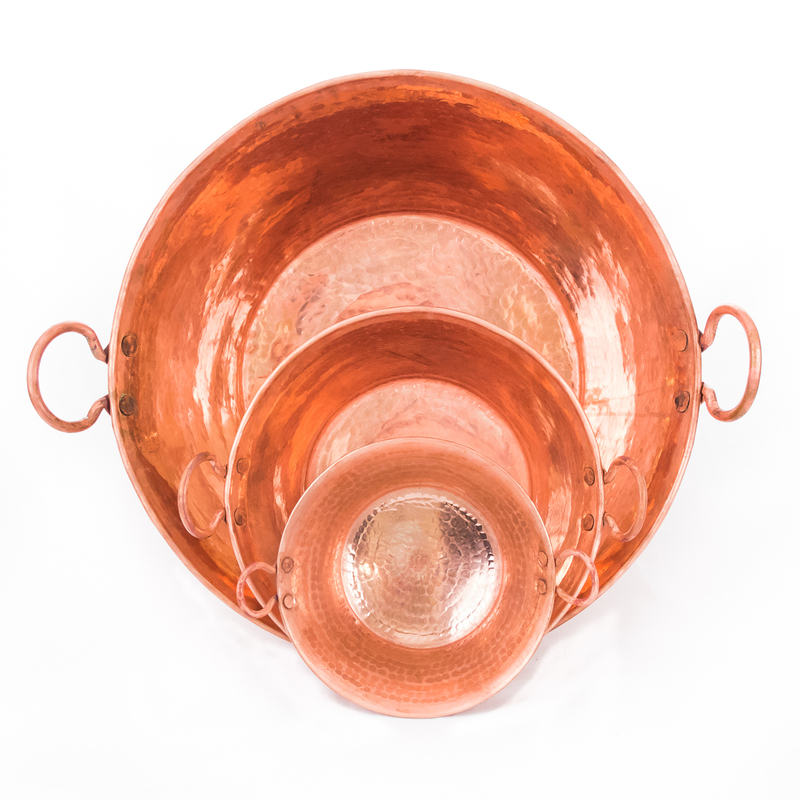 The copper Cazo should be hand washed with mild soap and a soft sponge or wash cloth, drying it immediately. Steel wool or scouring pads should not be employed as they may damage or scratch the surface. You should also avoid harsh detergent or dishwashers as these may accelerate the oxidation process of the copper and reduce the life span of the piece. The copper will naturally darken and develop what is called a “patina”. To remove the patina, you can rub the outside with a vinegar-salt solution. To keep it looking new, you can also use a copper polish product and follow the manufacturer’s instruction. Before you use your Mexican Copper Cazo for the first time; it should be “cured”. This curing process also removes any patina from the manufacturing process and makes the copper shine. Spread white vinegar and salt all over the surface using a new sponge or dish cloth that has not been used with soap. The vinegar may turn dark or green. Continue spreading the vinegar and salt, especially any dark spots until the pink copper color is viewed evenly throughout the pot. Wash the pot in cool water and mild soap. After the pot is completely shinny, fill the Cazo with water and bring to a boil. Continue to boil for 10 minutes. Remove the heat and once the water is cool, empty the Cazo and dry it thoroughly. Your Cazo is now ready to use.